What is ASP.Net MVC 5? ASP.Net refers to a popular web application framework which was developed and primarily marketed by Microsoft as a means of helping programmers in effectively building highly dynamic web applications, web services and websites. MVC is the latest edition in ASP.NeT for web applications. By using MVC a programmer or web developer can use two different programming models. One is related to ASP.NeT Web applications while other one is using of ASP.Net Web Forms. MVC application is designed and applied by using the model, view and controller attributes. Model carries the basic and core information for an application that ranges from data and validation rules. View is related to presentation and harmonization of application to support with HTML and other markup languages. Controller is responsible to control the logic flow. It connects with model and view attributes to control the information flow and execution of the application. ASP.NeT MVC 5 is an updated version that is based on the framework for building standard web applications with excellent scalability as well as use of well-established designs and patterns with power of ASP.Net and .Net architecture. 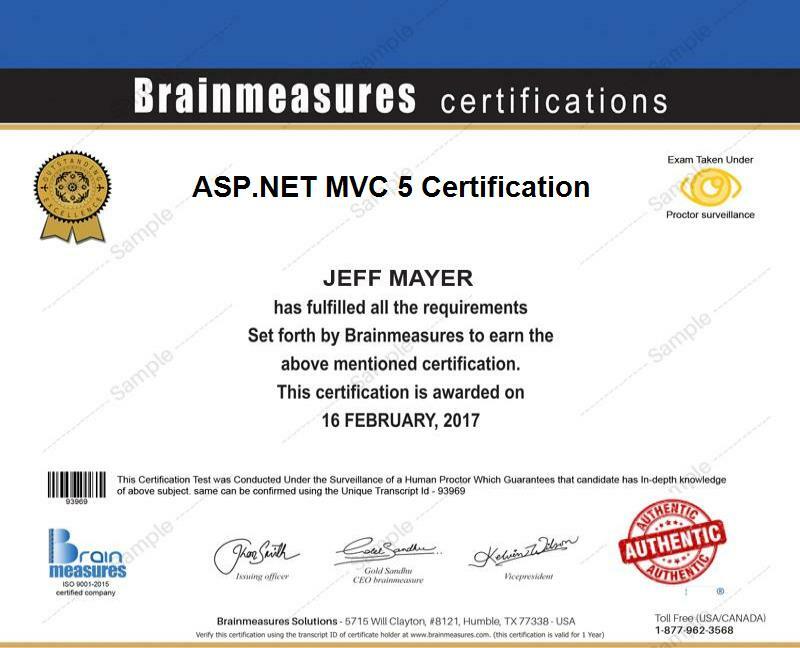 If you are one of those who dream of becoming experts in running and understanding about the ASP.Net MVC 5 framework, then Brainmeasures certification course is the perfect selection for you. One of the many things that you will surely enjoy about enrolling in the ASP.Net MVC 5 course offered by the organization which is primarily developed in such a way that even the most complex concepts, elements and features associated to the framework can be clearly understood. With the comprehensiveness of the ASP.Net MVC 5 training offered by this company, it will no longer become surprising if you will receive a more thorough guide about the basics of using the framework in quickly building dynamic, powerful and highly sophisticated websites. The certification course also gives you a more solid understanding about the key concepts associated to the MVC 5 environment, its installation process, framework architecture, security measures, web applications environment, from static to dynamic web applications, state management, error handling, master pages and session state management. As ASP.Net MVC 5 is rapidly using in the computer and web programming with applications of dynamic website development, therefore holders of the certification are not only skilful and equipped with expertise of web designing and development but also get the higher salaries and income. Expected salary varies from business to business need for website development and online data security. However, an average expected salary for an ASP.Net MVC 5 certification holder is expected around $85,000-$130,000 per year which varies according to the nature of business, related field and reputation of the company in the related field, level of competition as well as experience of the individuals who are providing their services or employed in different companies that belong application of .Net framework for soft-wares and website development. The ASP.Net MVC 5 certification program which you can now easily get at Brainmeasures aims to offer a lot of help to a wide range of professionals especially those who are related to the computer science and IT industry. This course is extremely useful for aspiring and existing web and application developers, webmasters, web programmers, software programmers, dynamic applications developers, students and teachers of IT, Website development and computer science who plan on using the ASP.Net framework especially MVC 5 platform in their attempt to build the most effective and fascinating websites.